Wireless energy transfer is a broad research area that has recently become applicable to implantable medical devices. Wireless powering of and communication with implanted devices is possible through wireless transcutaneous energy transfer. However, designing wireless transcutaneous systems is complicated due to the variability of the environment. 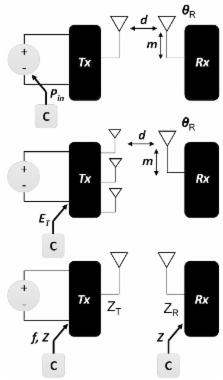 The focus of this review is on strategies to sense and adapt to environmental variations in wireless transcutaneous systems. Adaptive systems provide the ability to maintain performance in the face of both unpredictability (variation from expected parameters) and variability (changes over time). Current strategies in adaptive (or tunable) systems include sensing relevant metrics to evaluate the function of the system in its environment and adjusting control parameters according to sensed values through the use of tunable components. Some challenges of applying adaptive designs to implantable devices are challenges common to all implantable devices, including size and power reduction on the implant, efficiency of power transfer and safety related to energy absorption in tissue. Challenges specifically associated with adaptation include choosing relevant and accessible parameters to sense and adjust, minimizing the tuning time and complexity of control, utilizing feedback from the implanted device and coordinating adaptation at the transmitter and receiver. The dielectric properties of biological tissues: III. Parametric models for the dielectric spectrum of tissues. A parametric model was developed to describe the variation of dielectric properties of tissues as a function of frequency. The experimental spectrum from 10 Hz to 100 GHz was modelled with four dispersion regions. The development of the model was based on recently acquired data, complemented by data surveyed from the literature. The purpose is to enable the prediction of dielectric data that are in line with those contained in the vast body of literature on the subject. The analysis was carried out on a Microsoft Excel spreadsheet. Parameters are given for 17 tissue types. Copyright statement: © 2016 by the authors; licensee MDPI, Basel, Switzerland. This article is an open access article distributed under the terms and conditions of the Creative Commons by Attribution (CC-BY) license ( http://creativecommons.org/licenses/by/4.0/). A power efficient electronic implant for a visual cortical neuroprosthesis. Wireless and inductively powered implant for measuring electrocardiogram. Constant pressure fluid infusion into rat neocortex from implantable microfluidic devices.